The Kilkenny Team to face Tipperary in the Allianz League Final on Sunday has been named. Click for full details. The GAA have announced ticket details for the Allianz League Final between Kilkenny and Tipperary and for the Littlewoods Camogie League Final where Kilkenny take on Cork. The Camogie final will have a throw-in of 1.30pm and the Hurling decider will have a throw in of 3.30pm. Tickets are now on sale on gaa.ie and through the usual Centra/Supervalu outlets. Pre-purchase tickets are Adults €25, Match Day tickets - Adults €30, Students/OAPS € 25 and Juveniles/U16's €5. Seating is unreserved, but stand specific. Season ticket holders will be accommodated in Ardán de Grás, off Hebron Road (Stile No's 12-17). The GAA have this evening (Saturday) announced that both Ardán Breathnach and Ardán de Grás are sold out and just a handful of tickets are still on sale for Ardán Ó Cearbhaill. Terrace tickets are now on sale, Adults €20, Juvenile €5. Any remaining tickets will be on sale tomorrow at Nowlan Park. from 12.45pm. Click below for further ticket, venue and parking details. 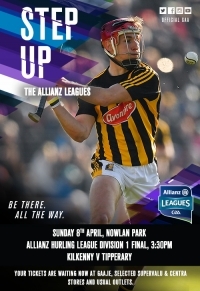 Kilkenny will now face Tipperary in the Allianz League Final next weekend, following a nine point win over Wexford in Wexford Park on Sunday. Kilkenny went 1-1 down after the games open exchanges but fought back strongly leading from the 17th minute until the final whistle. The overall team performance was strong and was consitent with what we have witnessed in the early games of the campaign. Next Sunday's game will be a tight affair, one which is expected to draw a large crowd to Nowlan Park. The GAA has now confirmed that Kilkenny will play Wexford this Sunday in Wexford at 2pm in the Allianz League Semi-Final. The sides have met twice already this year in the Walsh Cup and in the League, so this third encounter will be eagerly awaited. The winners of this Semi-Final will go on to play the winners of Limerick and Tipperary the weekend after next. Click for ticket, venue and parking details. The Kilkenny team to face Wexford in the Allianz League Semi-Final on Sunday has been named. Click for more details.